The Peoples Democratic Party, PDP and the All Progressives Congress, APC have emerged from the supplementary governorship elections held in five states over the weekend with victories and failures in their kitty. The states are Kano, Sokoto, Benue, Plateau and Bauchi. Going by the results announced by the Independent National Electoral Commission, INEC, the PDP won in Sokoto and Benue States while maintaining lead in Bauchi State. This is as the APC retained Kano and Plateau States. In Sokoto State, Governor Aminu Tambuwal of the PDP was re-elected for a second term after defeating the APC candidate, Ahmad Aliyu, to emerge the winner in a hotly contested exercise. However, the margin of victory was only 342 votes, according to INEC. The INEC Returning Officer, Fatima Mukhtar, formally declared Tambuwal winner yesterday afternoon. She said he scored the highest number of votes after the summation of results from both the March 9 first ballot and Saturday’s supplementary election in Sokoto State. In the supplementary election, Tambuwal polled 24,444 votes. He scored 489,558 votes in the inconclusive first ballot, bringing his total to 512,002. His main opponent, Aliyu of the APC, polled a total of 511,660 votes, being the sum of 486,145 and 25,515 in the first ballot and supplementary election, respectively. Tambuwal narrowly defeated his former deputy with 342 votes, helped by.the lead he had established in the first ballot of March 9. A total of 31,662 votes were rejected, while 1,036,332 votes were recorded as valid, bringing total votes cast to 1,067,994. Sokoto has 1,887,767 registered voters, 56.5 per cent of whom turned out for the governorship election as the number of total votes cast shows. In Benue State, Governor Samuel Ortom emerged winner of the supplementary election after scoring 434,473 while Jime of APC pooled 345, 155 votes. It could be recalled that the commission had declared the March 9th March, 2019 Governorship election in Benue State inconclusive based on the fact that the number of canceled votes of 121, 019 superseded the margin of lead which was 81,554. Making the declaration at the INEC headquarters in Makurdi yesterday, the State Returning Officer Prof Sabastine Maimako Prof. Maimako said the total number of registered voters was 2,471894 and the number of accredited votes was 856,947.
of Benue State”, he said. Following the declaration, Makurdi, the State capital went into frenzy as supporters of the PDP jubilated. While the reelected Governor hurried to the Redeemed Christian Church of Nigeria to dedicate his victory to God. However, the APC in Benue State has rejected the outcome of the supplementary governorship election which returned Governor Samuel Ortom as winner. He also, alleged that the results announced in favour of Governor Ortom and the PDP is a direct product of brutal violence, vote buying, ballot-stuffing, results-falsification, nonuse of the card reader and a range of other irregularities that have no place in our electoral laws. He stated unequivocally that the Benue APC will explore all constitutional and legal options available to ensure the votes of the people count. In Bauchi State, the governorship candidate of the PDP, Bala Muhammed, maintained a clear lead as at yesterday. Muhammed, a former senator and FCT minister, was on Sunday declared by INEC to have won the highest number of votes in the just concluded supplementary governorship election. He pulled over 6, 376 votes to beat the incumbent Bauchi state governor, Muhammed Abubakar of the APC, who polled 5, 117 votes. Incumbent Governor Simon Lalong of the APC was yesterday declared winner in the rerun governorship election in Plateau State. Lalong defeated his closet rival , Jeremiah Useni, of the People’s Democratic Party ( PDP). The governor scored 595,582 votes while Mr Useni of the PDP second 546,813 votes. However, Useni has rejected the results saying he would head to court to seek redress. The governor of Kano State, Abdullahi Umar Ganduje of APC was also yesterday declared winner of the Kano State governorship election. Ganduje defeated his major contender, Abba Kabir Yusuf of PDP with 8,990 votes. The result of the election put Ganduj ahead, having scored 1,033,695 votes against Yusuf who polled 1,024, 705 votes. Announcing the result, the INEC returning officer for the Kano rerun election, Professor Bello Shehu said Ganduje is returned elected, having satisfied all the requirements stipulated by the electoral body. But the PDP has insisted that Abba Yusuf won the Kano governorship rerun election, saying INEC’s manipulation is a recipe for crisis. 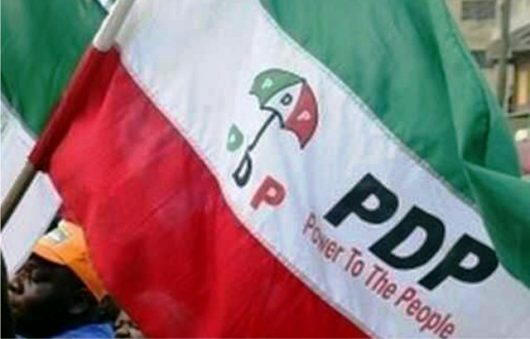 The PDP in a statement on Sunday signed by Kola Ologbondiyan National Publicity Secretary and Director, Media & Publicity PDP Presidential Campaign Organization, said its candidate, Abba K. Yusuf, is the rightful winner of the Kano state governorship election, saying any declaration that does not reflect such cannot stand. APC in connivance with INEC officials and armed security thugs rigged the elections in Kaduna and Kano. The tribunal would upturn this fake victory. It is just a matter of time. What a country. What a sham rerun election. What a brazen daylight heist of the people’s mandate.